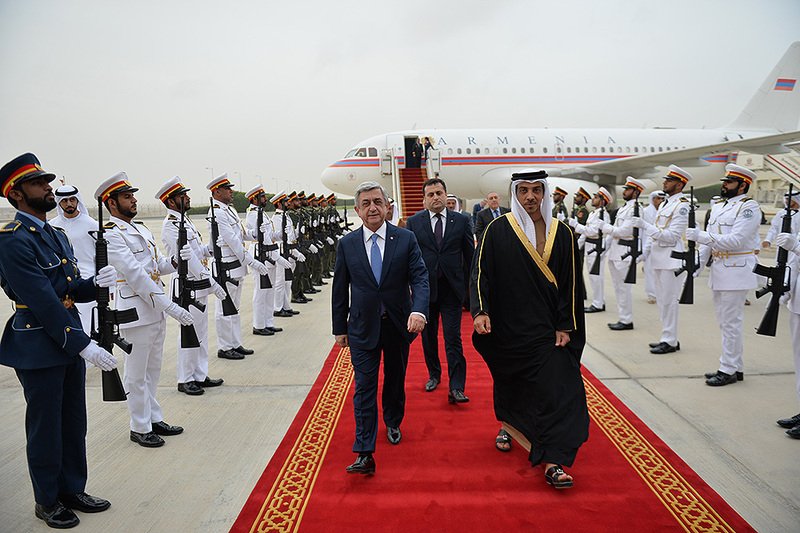 President Serzh Sargsyan has arrived on a working visit to the United Arab Emirates. 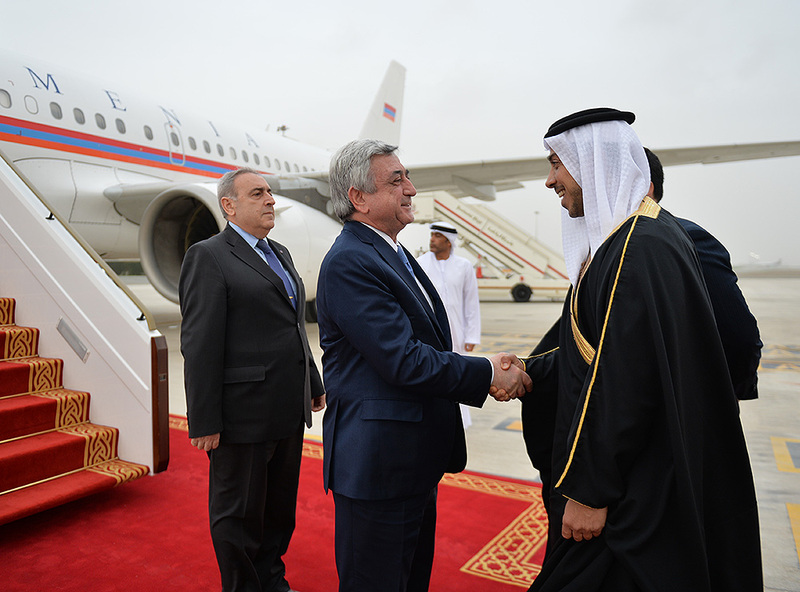 At the Abu Dhabi airport, the President of Armenia was greeted by the Vice President of the UAE, Minister of presidential affairs Sheikh Mansour bin Zayed Al Nahyan. 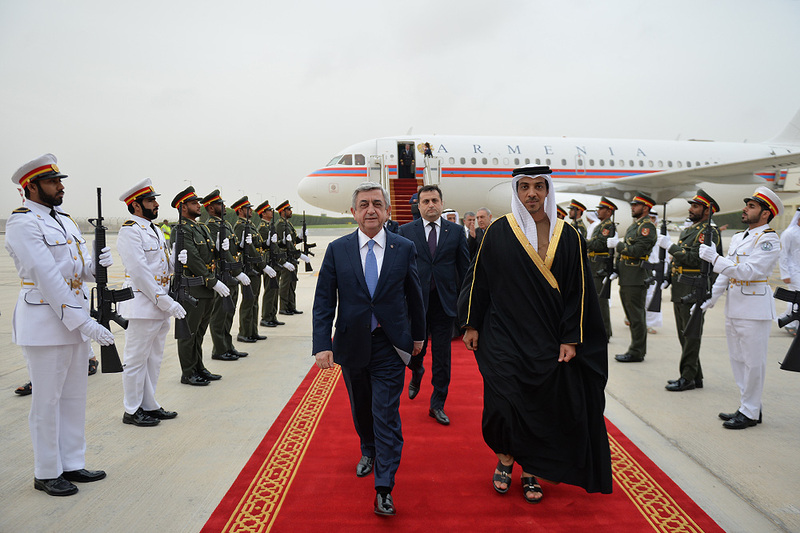 After the official welcoming ceremony, the President of Armenia had a meeting with Minister Sheikh Mansour bin Zayed Al Nahyan. Serzh Sargsyan expressed gratitude for a swift organization of the forum on Armenia’s investment opportunities. 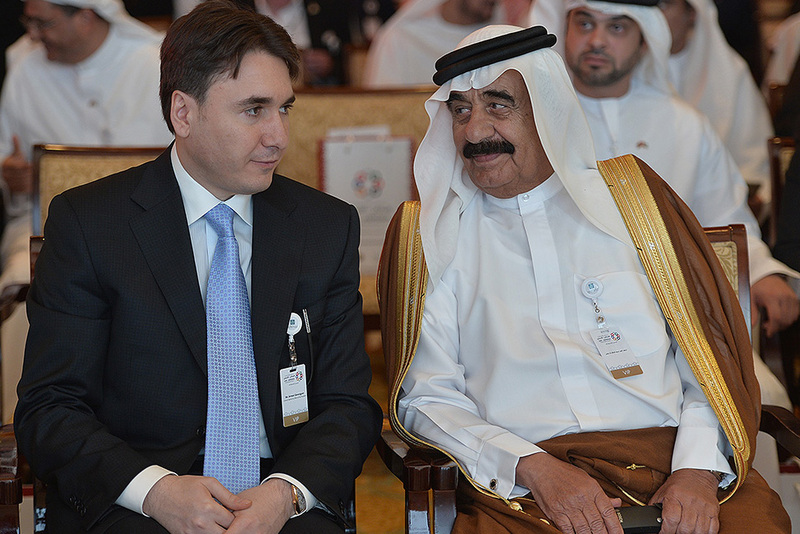 The agreement to conduct such forum was reached during President’s previous meeting to the friendly UAE. 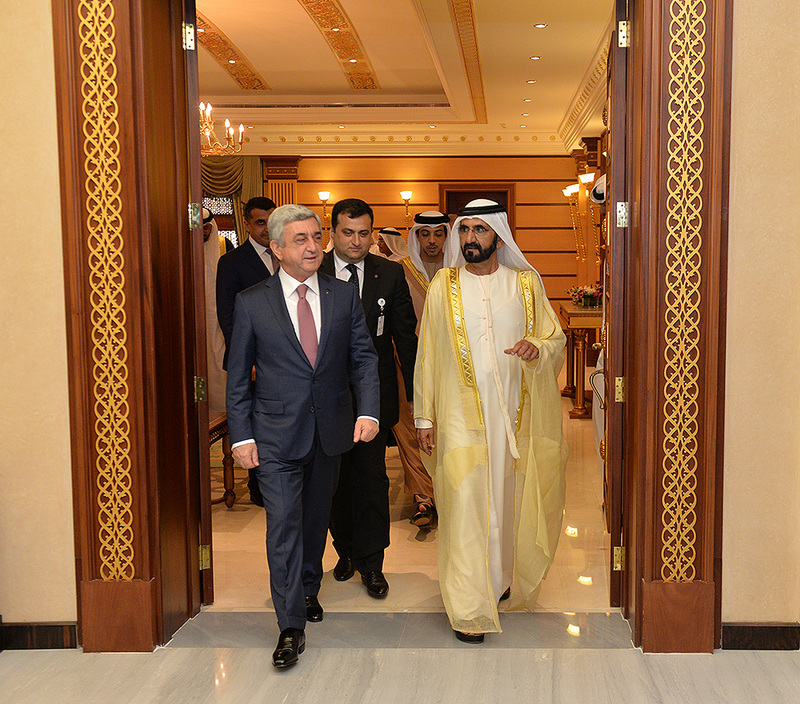 President Sargsyan expressed hope that the results of the forum, as well as agreements reached with Sheikh Mansour bin Zayed Al Nahyan will have their considerable input and role in the development of the Armenia-UAE relations. 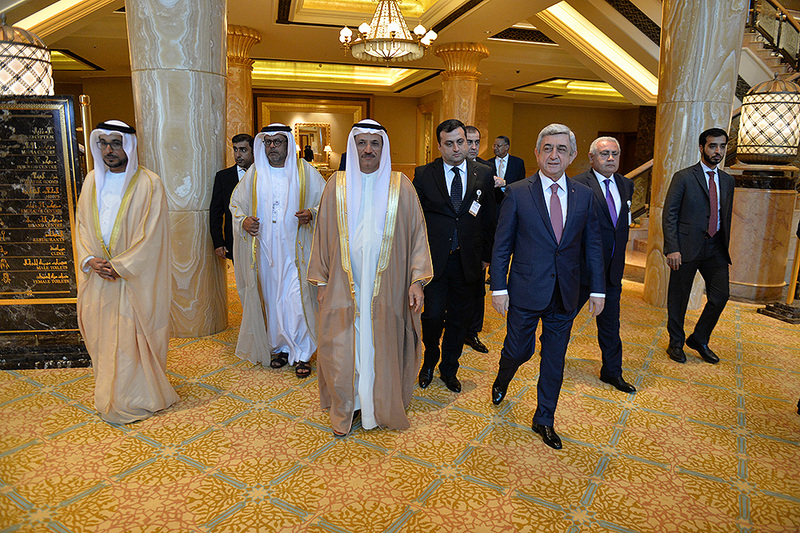 President Serzh Sargsyan had a substantial talks related to Armenia-United Arab Emirates investment forum also with the Minister of Economy of UAE Sultan Al Mansouri. 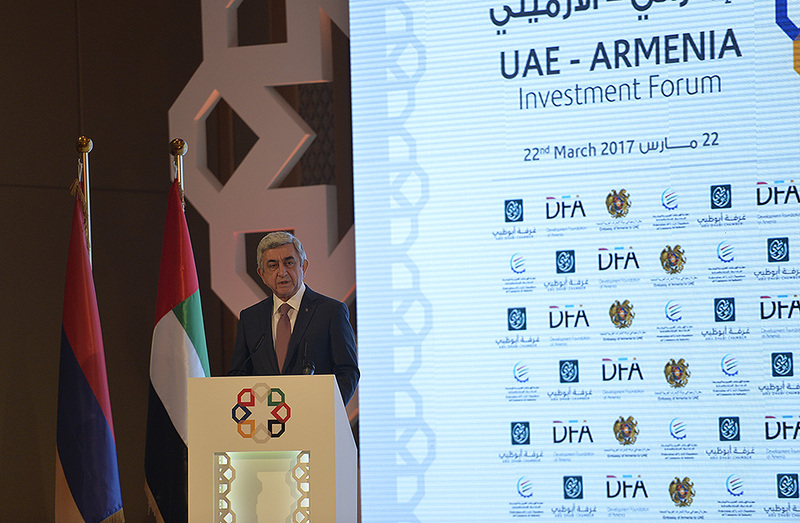 President Serzh Sargsyan, who is the United Arab Emirates on a working visit, participated today at the Armenia - United Arab Emirates investment forum. 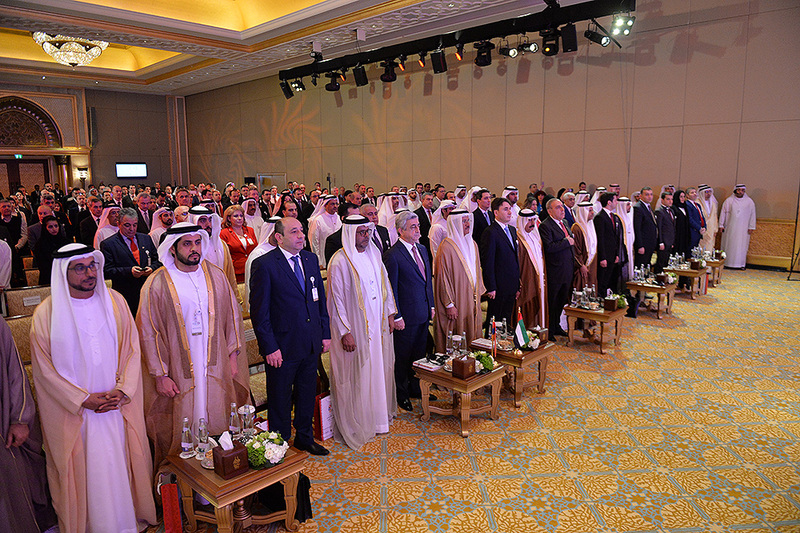 The forum is organized under the high auspices of the President of Armenia and the Crown Prince of Abu Dhabi Emirate, Deputy Supreme Commander of the UAE Armed Forces Sheikh Mohammed bin Zayed Al-Nahyan. 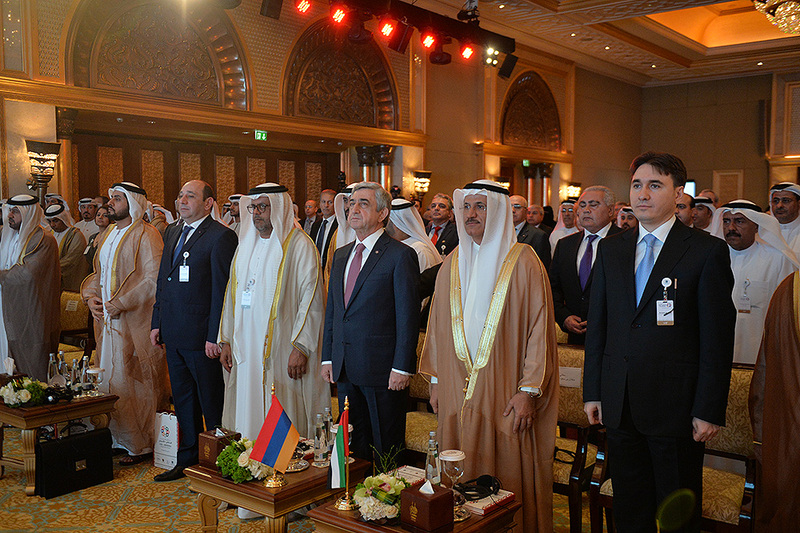 The forum organized by Armenia’s Development Fund and Chamber of Commerce of Abu Dhabi is called to boost economic relations between Armenia and Arab states, encourage contacts between the entrepreneurs, present the investment climate in Armenia and mutually beneficial investments projects in different areas. Among over 300 participants of the forum are state officials, heads of funds, pan-national companies, international organizations, representatives of the companies which have successful experience of making investments in Armenia. 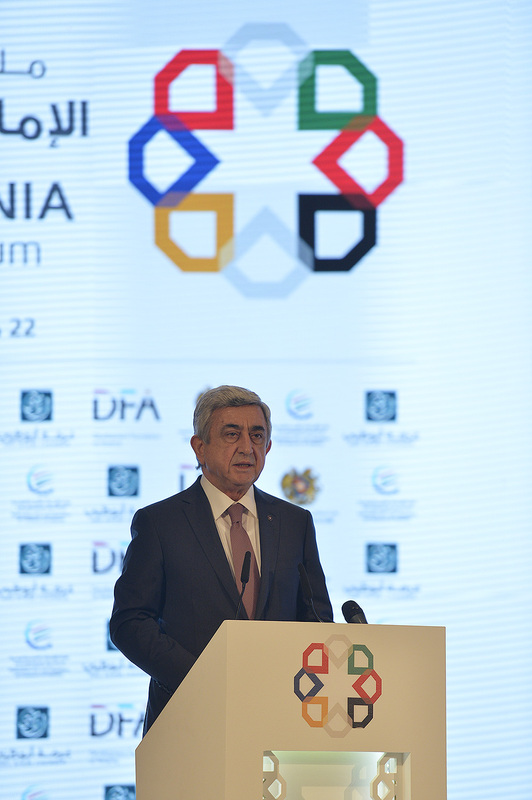 At the forum, after the welcoming remarks of the Minister of Economy of UAE Sultan bin Saeed Al Mansoori, President Serzh Sargsyan made a statement. I am extremely delighted, and it is also of symbolic significance that only four months after my previous official visit I am hosted once again at this friendly land. 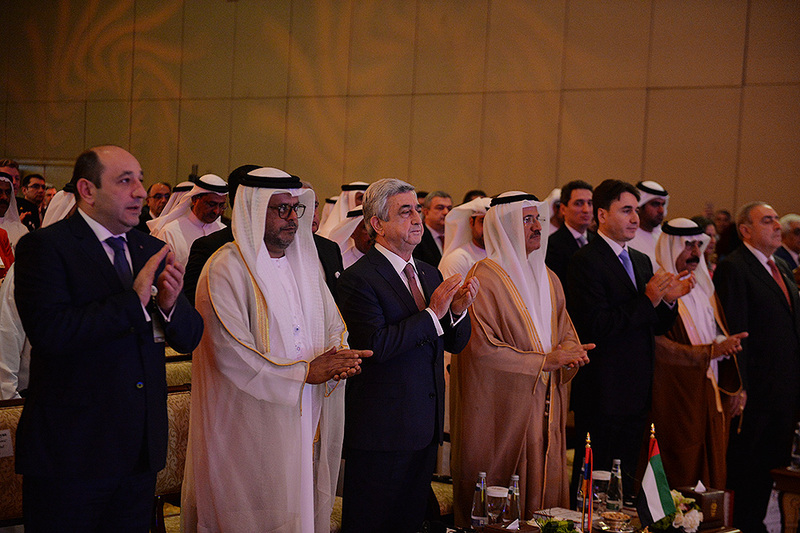 I salute you cordially in this wonderful hall: such an exceptionally representative event comes to attest to the mutual desire and commitment of the highest authorities of our countries to elevate to a qualitatively new level the economic relations between Armenia and UAE. Only months ago, this was merely an idea, whereas today it has become a realiy, of which we expect a lot. I would like to express my particular gratitude to the authorities of the United Arab Emirates and especially to the Crown Prince of the Emirate of Abu Dhabi, Deputy Supreme Commander of the UAE Armed Forces, His Highness Mohammed bin Zayed Al Nahyan for bringing this idea to life. The Armenian-Arab friendship withstood the test of time and, in our days it has become a solid foundation for the relations between Armenia and amny Arab states. 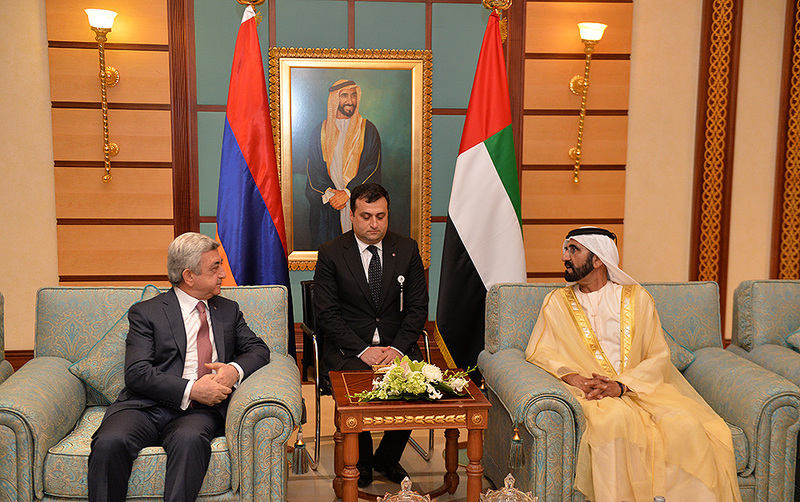 It was on this foundation, during the reign of the blessed memory Sheikh Zayed bin Sultan Al Nahyan, the founder of the United Emirates, that the official cooperation between the Armenia and the United Arab Emirates took root. And today it is our wish and also our duty to strengthen and deepen the precious legacy we received. Throughout its history Armenia, was at the crossroads of the East and the West, and because of that the Armenian people were recognizable in both these worlds. At the same time the East and the West had mingled on our soil which is reflected in the mindset and lifestyle of our nation. 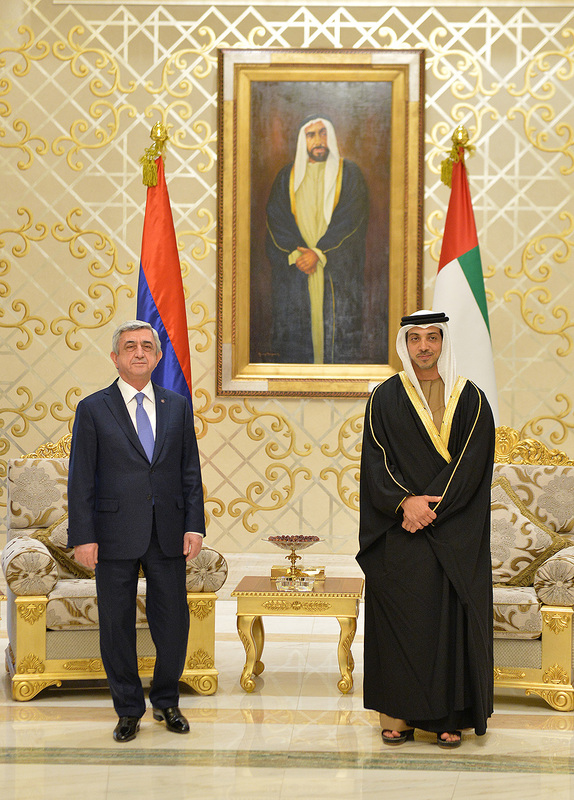 This means that if you come to Armenia, you will not only discover the environment conducive for doing business, but will also find familiar features the most characteristic of which, perhaps, is traditional Armenian hospitality and warmth, so typical for our fraternal Arab people as well. Naturally, some of you have your own perception of Armenia, though many yet have to discover it, especially as a country with economic potential. But before you do, let me highlight some aspects of doing business in Armenia, some important prerequisites from the perspective of a mutually beneficial partnership. It is incontestable that perhaps the most crucial factor for the mutually beneficial partnership is trust. In this rapidly changing competitive world, long-term partnerships may be forged and investments may be made only if there exists the atmosphere of trust. This is something we do share in earnest. Our peoples know each other historically, and by virtue of history having lived side by side with the Arab people and being exposed to the Arab civilization, we appreciate the value of trust very well. Despite the hard time that befell upon us throughout our history, we never gave in, spread all over the world and became successful businessmen. We are not intimidated by constraints imposed upon us, and we do our best to turn them into competitive advantages. Having no fossil fuel, we develop human resources; subjected to a double blockade, we build integration bridges; being a landlocked country, we open up to the world through our Armenian communities spread all over the world, we communicate setting up alternative ways and taking advantage of the state of the art technology. This is best testified to by the fact that Armenia today has turned into a country offering sophisticated turnkey technological solutions and services, taking up its specific niche on the mainstream global ICT map. You have the opportunity to see fpr yourself through your own experience that Armenia has created a conducive framework for doing business and a free investment environment protected by law. This is attested to by the World Bank 2017 Doing Business Report in which Armenia ranks the 38th among 190 countries; moreover, it ranks the 9th with regard to simplicity of starting a business. As for the economic freedom indicator, this year marked unprecedented progress: our country currently is the 33rd, which means we have improved our standing over last year by 21 notches. Our government has created investment packages which I keep in the focus of my immediate attention. 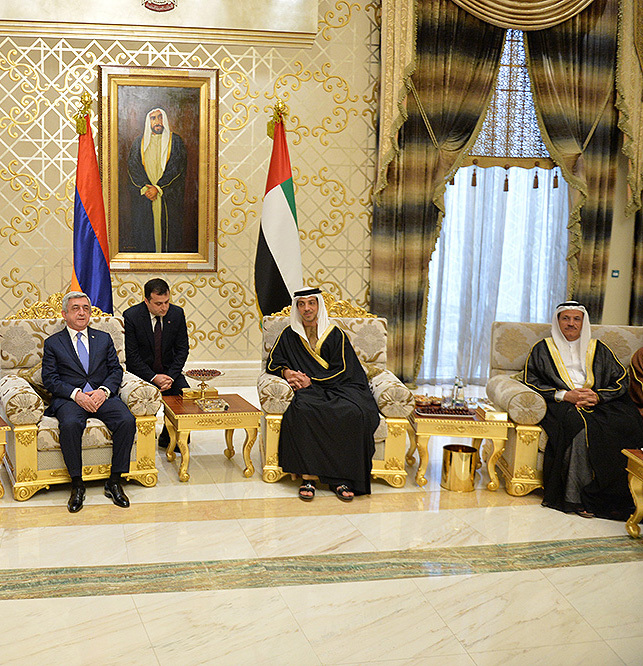 We shall welcome and support investors from the United Arab Emirates in various sectors of the Armenia economy. There are great opportunities for cooperation in agriculture and food processing. Organic and greenhouse farming is growing in Armenia day by day, the produce of which, I believe, is in great demand in your country as well. Armenia has earned itself a reputaion in canning and drying fruits and vegetables, producing juices, and drinking water from our springs has long been the country’s showpiece. One of the world’s tastiest fruits - sun-drenched apricot, is indigenous to Armenia, in academic taxonomy it is called Prunus Armeniaca. Armenia’s free economic zones may serve as an effective platform for cooperation in these sectors. Alliance, geared towards high-tech and innovative production, as well as Meridian for jewelry, precious stones and watchmaking; operation within these zones enjoys an almost total examption of taxes and duties. Another one is in the pipeline, a free economic zone with a broader scope, to become an effective platform for entry to the markets of the EAEU, EU and the Middle East countries. 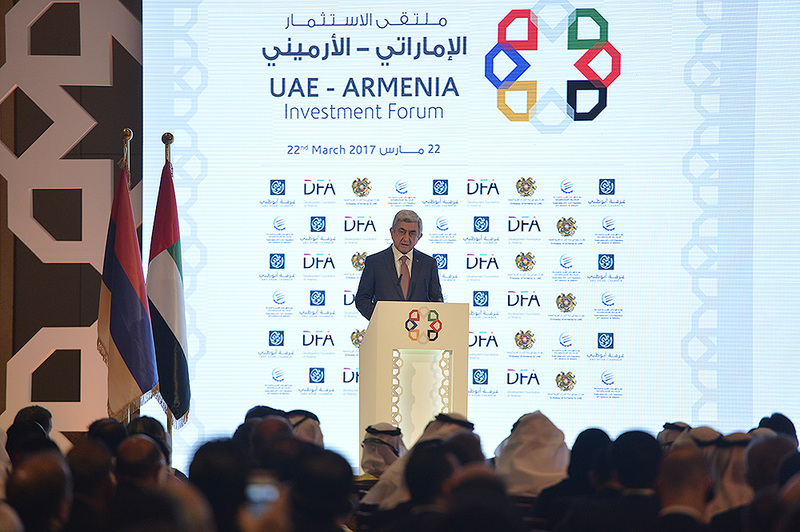 Armenia offers to the UAE businessmen a continually increasing market as Eurasian integration has expanded Armenia’s economic boundaries to nearly 1/7th of the world’s mainland. Along with that recent negotiations between Armenia and the EU on the Comprehensive and Enhanced Partnership have been completed. 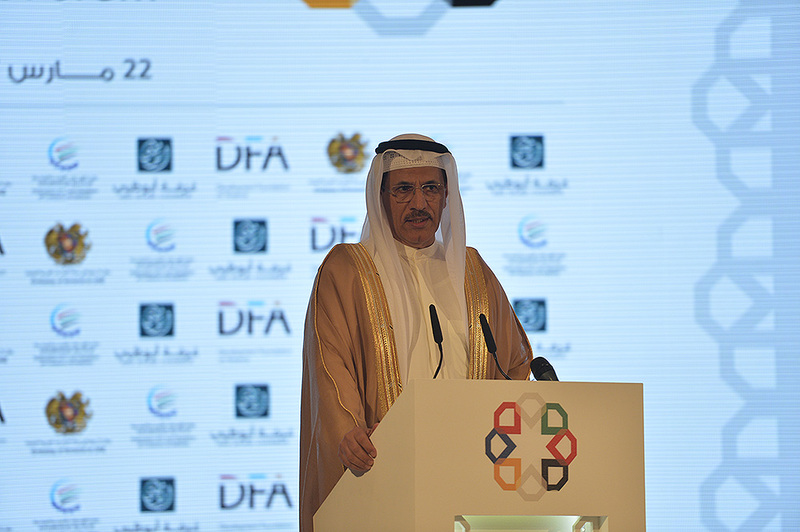 It creates a new level of our economic relations with the European Union, new opportunities for trade and investments. Armenia had already been benefitting from the GSP+ regime with the EU, which allows to export to Europe more than 6,400 products made in Armenia on preferential terms. I am certain that working together we will register substanial accomplishments. This is best witnessed by the unprecedented growth of trade turnover between our countries: almost 2.5 times, as of the end of last year. Whereas this year there has been an exponential increase of more than 8 times, and we intent to keep up the pace. I have to mention tourism here - the best medium for friendship and people to people contacts, intercultural dialogue and getting acquainted with each other. I will acknowlwdge with pleasure that the number of tourists visiting Armenia from the United Arab Emirates is growing progressively: it increased by 44% just in 2016. I am certain that this is far from being the limit, especially considering that today, as we speak, a visa free entry regime to Armenia takes effect for the UAE citizens. Services available for tourists improve in Armenia consistently. The service sector in Armenia is the fastest growing sector in general, and our country stands out advantageously in the region in this respect. Incidentally, I would like to reflect on one more circummstance: within recent years Armenia has received 20,000 peope of the Armenian descent, who are equally bearers of the Armenian as well as Arab identity and culture. The presence in Armenia of such a solid cohort of bilingual individulas with remarkable entrepreneurial traditions, may directly and significantly facilitate the activities of the UAE investors in our country. I hereby invite every one of you to discover Armenia, with its remarkable mountaineous landscape, delicious cuisine, traditional Armenian hospitality, and, certainly, educated, hardworking and knowledgeable workforce, fit for contributing to any long-term project. 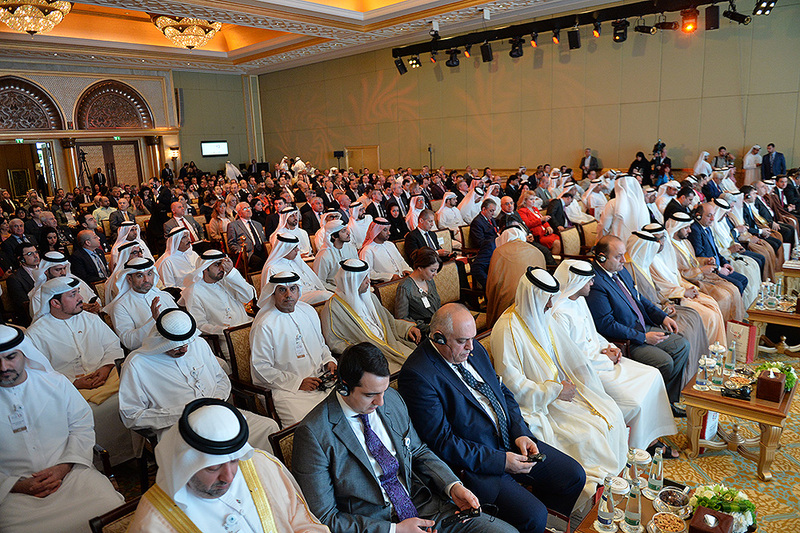 Thank you for your attention, and I once again express my gratitude to the leadership of the Emirates for organizating this splendid event. 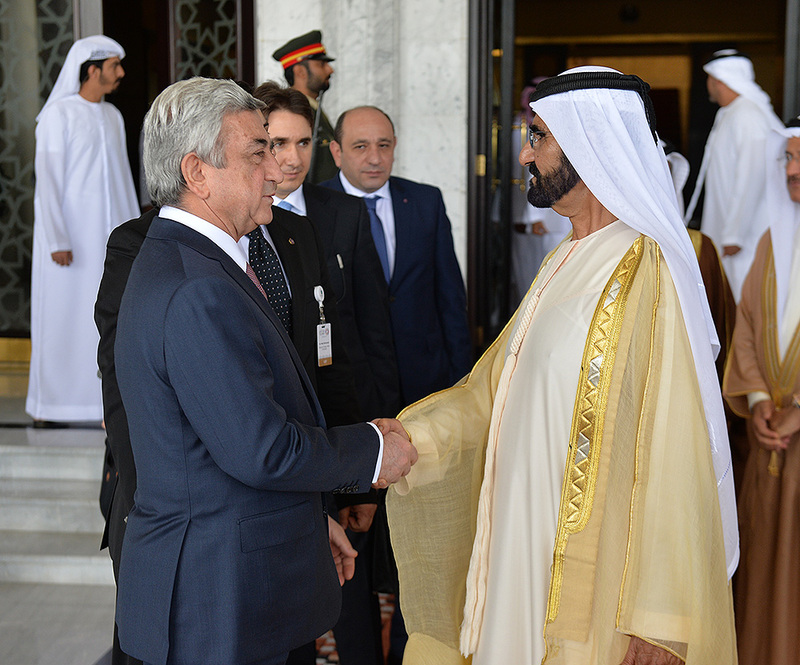 In Abu Dhabi President Serzh Sargsyan met with the Vice President, Prime Minister, Minister of Defense and Emir of Dubai Mohammed bin Rashid Al Maktoum. 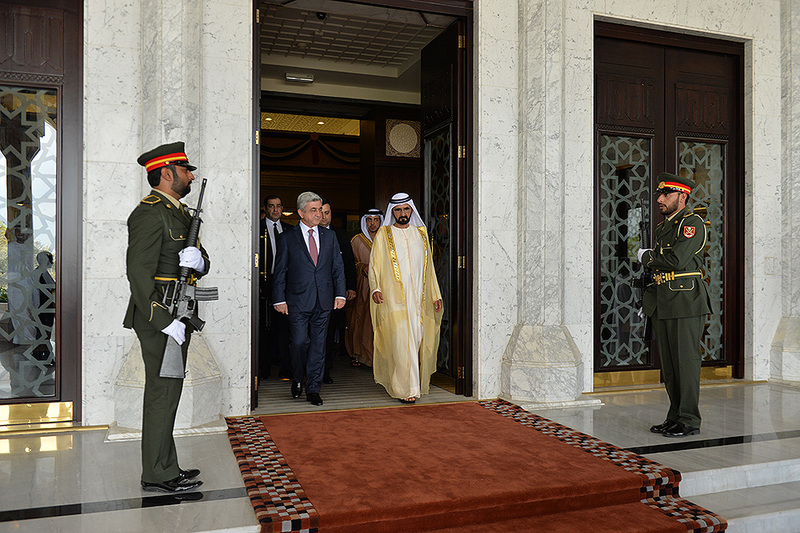 The President of Armenia expressed gratitude for the traditionally warm reception extended by the Emirate to his delegation. 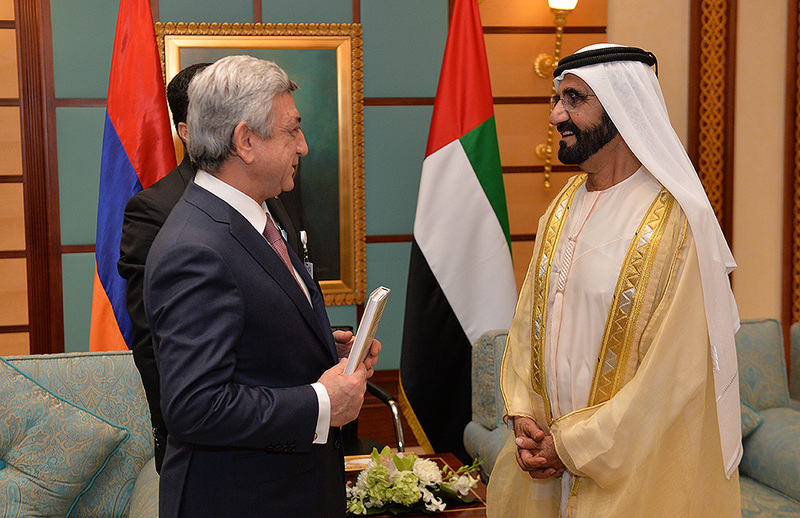 Noting that it hasn’t been long since he met last time with Sheikh Mohammed bin Rashid Al Maktoum, President Sargsyan recalled warmly his official visit conducted to the United Arab Emirates nearly four months ago and noted with satisfaction that it has elevated the bilateral interstate relations on a qualitatively new level. 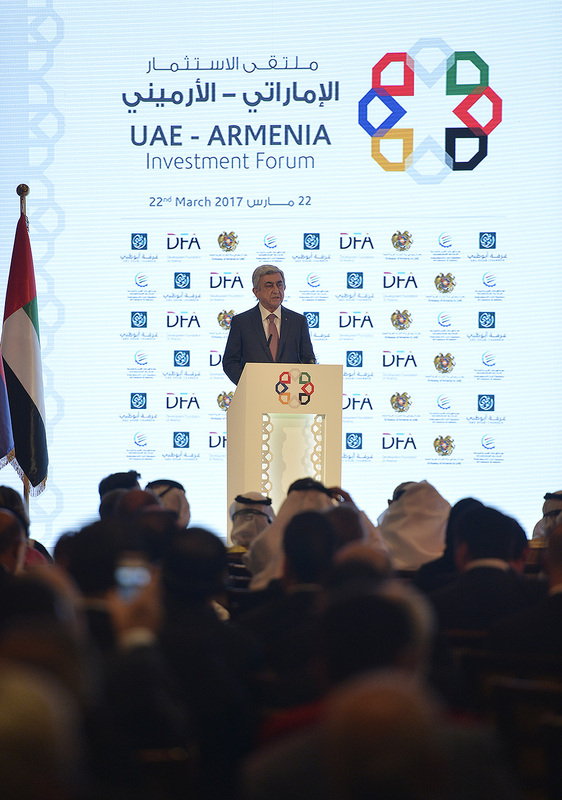 According to the President of Armenia, events, carried out in the wake of the reached agreements, are progressing smoothly, including the Forum on the investment opportunities of Armenia which is conducted in the friendly Emirates today. 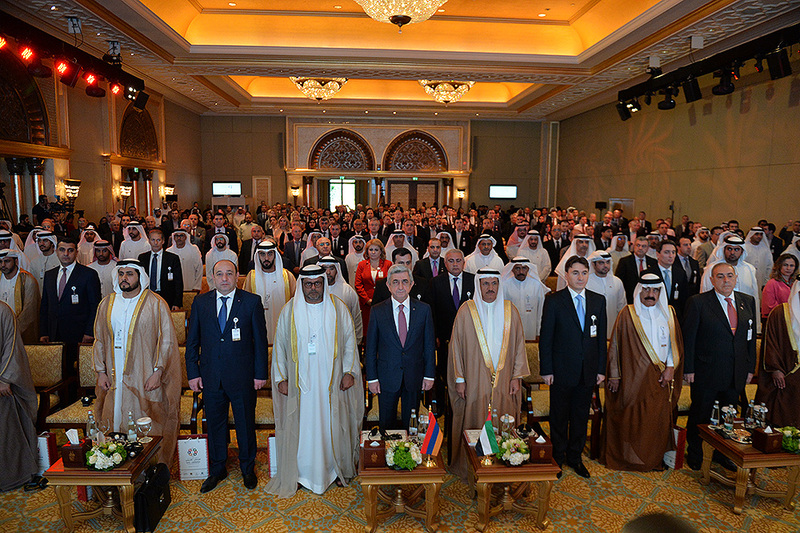 Serzh Sargsyan underscored that Armenia attaches great importance to the development of the cooperation, including the trade and economic relations, in parallel with the high-level political dialogue with the UAE. 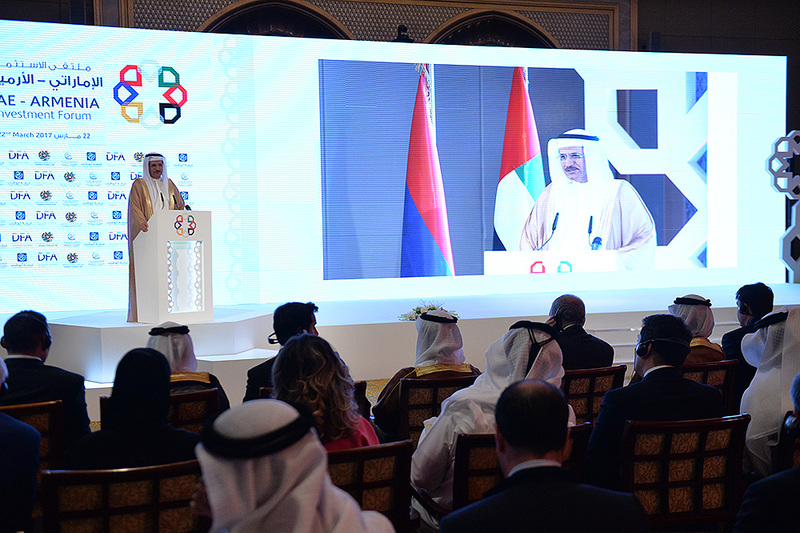 The President expressed confidence that the outcome of the forum and practical agreements reached in the framework of the forum will enjoy full support of both side and will bring their considerable input to the further development of the Armenia-UAE trade and economic relations. 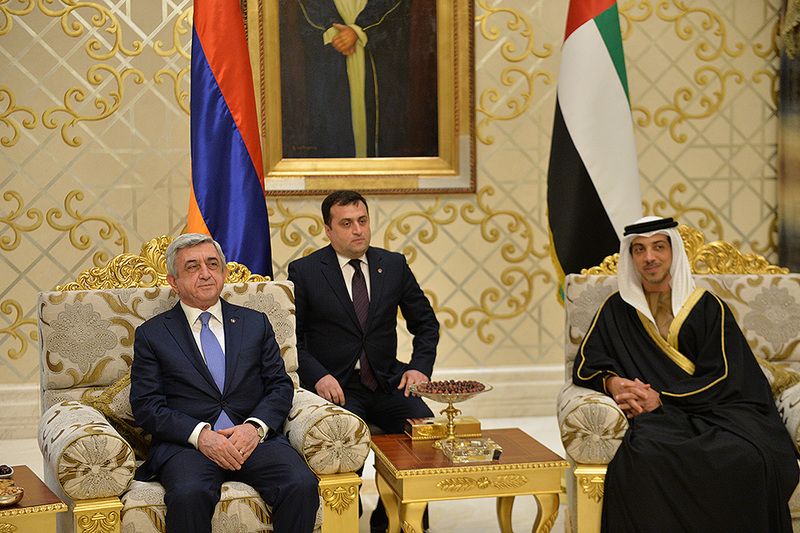 The President thanked for the invitation extended to Armenia to participate at the global Dubai Expo-2020 exhibition. 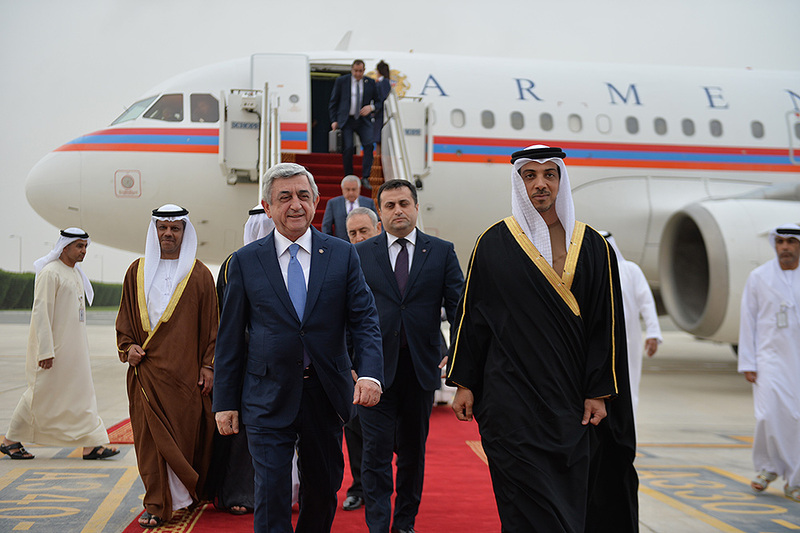 Stressing that development of the relations with the Arab world is a priority of Armenia’s foreign policy, President Serzh Sargsyan noted that with this regard the Armenian-Emirates relations occupy a special place and present an excellent example of cooperation. The parties concurred that the presence of diplomatic representations in the respective capitals considerably contributes to the development of the relations between the two countries. 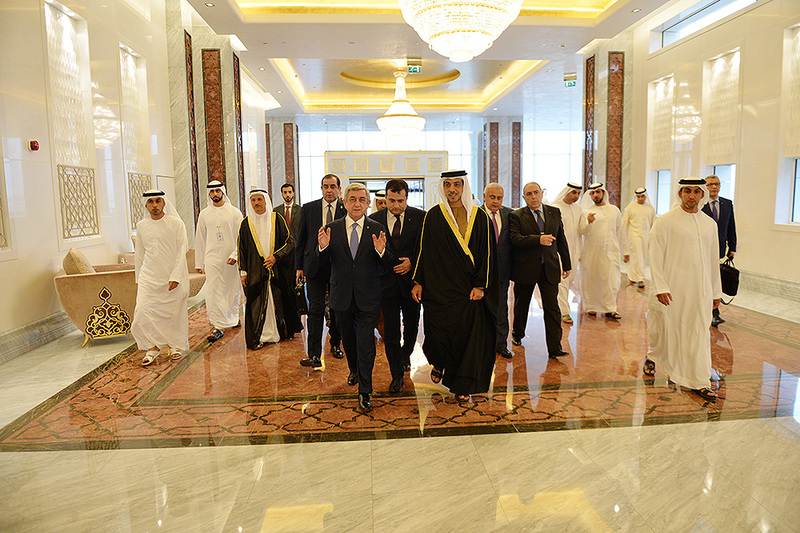 The President of Armenia expressed confidence that the establishment of the Consulate General in the trade and economic center of Dubai will give a new impetus to the development of the economic relations between Armenia and UAE. At the meeting, discussed was also the process of the implementation of the agreements reached during the Armenian President’s official visit. In that context, the interlocutors spoke with satisfaction about the RA Government’s decision to grant visa free regime to the citizens of the United Arab Emirates which has already entered into force. 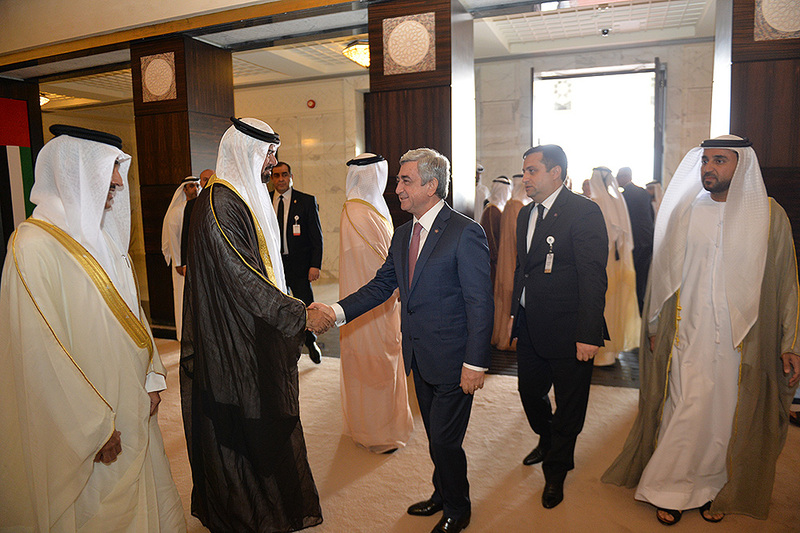 President Serzh Sargsyan and Sheikh Mohammed bin Rashid Al Maktoum assessed it as an importance step towards strengthening and development of the bilateral relations.